For some businesses, long-lasting success hinges on mastering the mailroom. Whether it’s for distributing marketing materials, sending out invoices, or getting readymade products in customers’ hands, making your mailroom work efficiently can represent a huge advantage. 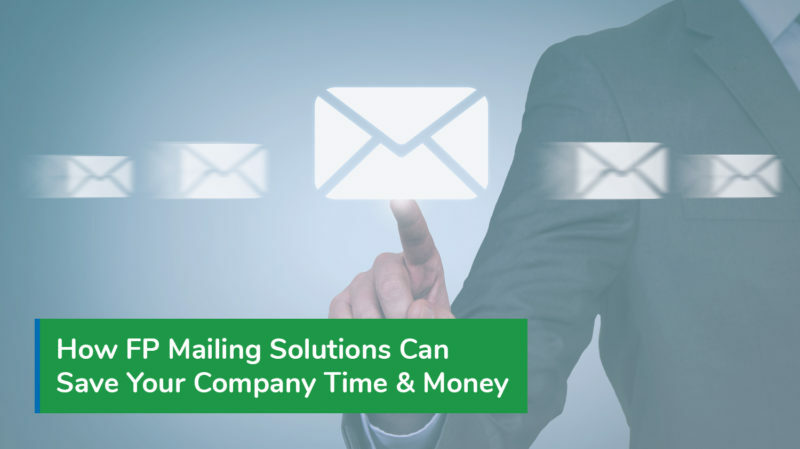 Although most business start out with an ad hoc mail solution, making frequent trips to your local post office can quickly become time-consuming and expensive. There comes a time when you need a complete mailing solution that lets you operate in an efficient, streamlined way. FP Mailing Solutions is the fastest growing commercial postal vendor in the United States. They offer three broad categories of postal service, ranging from Small Business, to Office and Enterprise solutions. Our key partnership with this company gives us an advantage when developing and implementing mailing room solutions for our clients. Rather than forcing our clients to use stamps or postage meters, we are able to implement complete mailing solutions that save both time and money. For instance, FP Mailing Solutions’ MailOne software is a fully integrated suite of applications that lets organizations print shipping labels, track packages and perform shipping accountancy using unlimited accounts on multiple devices. Using this kind of technology, you can improve your mailroom’s day-to-day workflow, reduce costs spent on package management, and enjoy easy, intuitive record keeping of packages sent out. While MailOne is a powerful application for handling shipping from your computer, the company’s lineup of PostBase postage meters is what truly stand out. When you choose to work with FP Mailing Solutions, you gain access to a wide range of automatic postage meters that use the latest technology to reduce the amount of time and money you spend per package sent. The PostBase Mini: This tiny postage meter is perfect for small businesses. It has a color touchscreen, operates almost silently, and leases for less than $25 per month. The PostBase Econ: This is an improvement over the Postbase Mini, adding Wi-Fi connectivity that lets you instantly create postage. The PostBase Auto: This mid-range postage meter can process 95 letters per minute and features a 4.7-inch touch screen. The PostBase ONE: This high capacity postage meter can process 150 pieces of mail per minute and offers built-in postage spend analysis as well as advanced networking capabilities. Imagine how much time it would take to manually post 150 pieces of mail and compare it to the speed of FP Mailing Solution’s products. Businesses that rely on sending out high volumes of postage stand to earn huge savings when compared to the opportunity cost of the next best option. For many organizations and their customers, package tracking is a deal breaker. Any postal service provider that fails to offer accurate, up-to-the-minute tracking of parcels sent is automatically rejected. Fortunately, FP Mailing Solutions’ latest offering is a state-of-the-art parcel tracker called QTrak. QTrak is a cloud-based parcel tracking solution that lets businesses manage inbound package shipments at any volume. Thanks to its decentralized cloud architecture, it is as viable a tracking solution for small business as it is for major global enterprises. With one user license, you can add unlimited individual users using unlimited handheld devices. Each one of those devices can become a digital signature pad, eliminating the need for parcel couriers to carry around handheld computers. Every package benefits from complete tracking information including pictures, notes, and additional information as needed. Furthermore, the solution stores no package data on handheld devices, making it compliant with most firms’ bring your own device (BYOD) policies. By keeping the data on the secure, encrypted cloud, even a lost or stolen mobile phone cannot be used to compromise customer data. This is just one of the many ways FP Mailing Solutions brings the future of post to our clients. Donnellon McCarthy Enterprises is an authorized FP Mailing Solutions partner. Ask one of our postage specialists for details on postage meters and tracking.